Get incredible control and versatility from this compact switcher. It functions well even on a small pedal board, and instantly enables you to do operations that are impossible with a normal set up. In this small housing, there are 3 effect groups that can freely set the routing, a BJF Buffer that switches between on and off, up to 16 possible presets available, and even a tuner out and an independent music switch are all included! 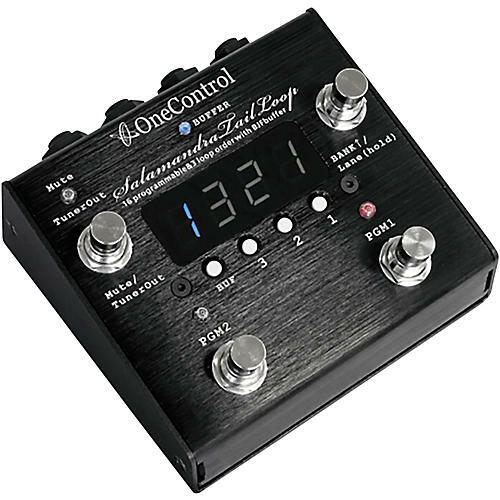 Not only controlling the entire pedal board, which uses a small number of effectors, but also controlling the effects (including some of the space distortion and amp effect loop) whose connection orders need to be changed depending on the track. While having these functions, it has simple and high-level operability using 4 foot switches, and large bright segment displays. It doesn’t take up space on the board and is easy to carry, but this programmable Switcher will vastly improve the operability. By choosing the routing with an open connection order of 3 effect loops, there are 16 possible combinations (including the all bypass setting). On the other hand, because the compact housing always limits the operability, fewer preset options allow for higher operability. You can save up to 16 presets with the Salamandra Tail Loop. This is the minimum number of presets to allow saving all of the connection orders, designed this way so as to maximize both the functionality and operability. You can save 16 presets on the Salamandra Tail Loop itself. The presets are saved as 2 programs, 4 banks, and 2 lanes so that you can activate the programs without many foot switches. Because of the compact size of the unit, a large number of foot switches would have made it difficult to use. So we designed it with two program settings in each bank. As there are 16 programs in all, at first we made it with 8 banks and 2 program structures using 4 foot switches, with bank up and bank down assigned functions, making it rather hard to use. So we redesigned the preset selection from an ergonomic point of view so it has only a bank up bank switch that cycles between up to four banks. Additionally, if you hold down the bank up switch for 2 seconds you can switch the lane. This way with only 3 foot switches you can use all of the presets. All of the presets can be operated with one foot, and you don’t need to go between multiple foot switches when you’re using it, which minimizes any mistakes during use. The 4th foot switch that is no longer used to select a preset now independently controls a mute/tuner out switch, dramatically improving operability. One Control has installed a preset lock slide switch so that you don’t accidentally change the preset by pushing a button by mistake during a performance. Audio routing is creating an audio signal flow. Audio routing is about a cable connecting the input from the effect, and going from the output to the next effect. The Salamandra Tail Loop allows you to freely switch the routing of 3 effect loops. Normally, when you connect a compact effect, the signal order is the order of connection, 1-2-3, but when you use the Salamandra Tail Loop, you can order the signals however you like 2-1-3, 3-2-1, etc. The settings for the connection order on the effect are simple, and the connection order is displayed as is on the display, so you can check the current connection order at a glance. You can make big changes to the effect and tone based on the connection order of the effect. For example, with a distortion effect and a booster pedal, depending on which one you connect first, you can switch between an increase in volume for the effect booster and a gain boost. It’s known as a reverb effect, and normally you connect it toward the back to make a space sound, and if you connect the display pedal in the front, it creates a tricky effect that assists in playing. Also, if you change the connection order of the wah-wah pedal and the fuzz pedal, you can choose which effect is emphasized. In this way, it’s possible to create new effects that you hadn’t even thought of before by changing the connection order and combination of various effects. The Salamandra Tail Loop can save the minimum necessary 16 program presets. There are up to two presets for each bank, so if you set some programs for all bypass, the number of programs will be suppressed. With the Salamandra Tail Loop, by pressing the foot switch of the program you have currently selected, you’ll instantly move into bypass mode. Since you can also set it to bypass all programs, the settings allow for flexible operation to meet your needs. The Salamandra Tail Loop has a BJF Buffer installed in the input area. The BJF Buffer is of very high quality, and is known for its natural, transparent sound. The Salamandra Tail Loop has four possible buffer settings for each program. The Salamandra Tail Loop has a standard center minus plug and a 2.1mm barrel type DC9V adapter. We made it compatible with an adapter that is used by many compact effects, so it doesn’t need any external adapter just for a switcher. Also, if you accidentally pull out the power adapter during a performance and lose power, the sound won’t be muted. If power is lost, it automatically switches to true bypass mode, and there is no interruption in the sound, allowing you to continue your performance.